Soak sago for 15 minutes (do not soak too long if u don't like it to be too powdery). Wash it to remove excess starch before and after soaking process. Boil about 3 cups of water in a saucepan. The amount of water should cover all sago pearls and bring to boil. Stir them constantly and make sure that they don't stick together. Cook until it is soft and translucent. Drain sago in strainer and wash it under running tap water to wash out the excess starch. Bring 250ml water and sugar to a boil till sugar dissolves. Combine tapioca flour with 1 tablespoon of water and pour into the syrup and stir over low heat until mixture is smooth. Off the fire and set aside to cool. Cut mangoes into cubes. Reserved 2/3 of them. Blend the rest of mango cubed with 100ml water. 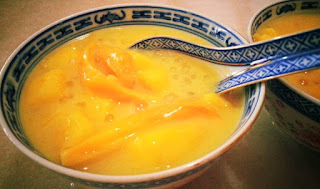 Add blended mango, mango juice and evaporated milk into the syrup solution and stir them well. Mix in sago pearls and stir. Chill for 2 to 3 hours and top it with jackfruits before serving.